Several years ago, in my job as a librarian, I got to catalog a really unusual item: a patent of nobility. 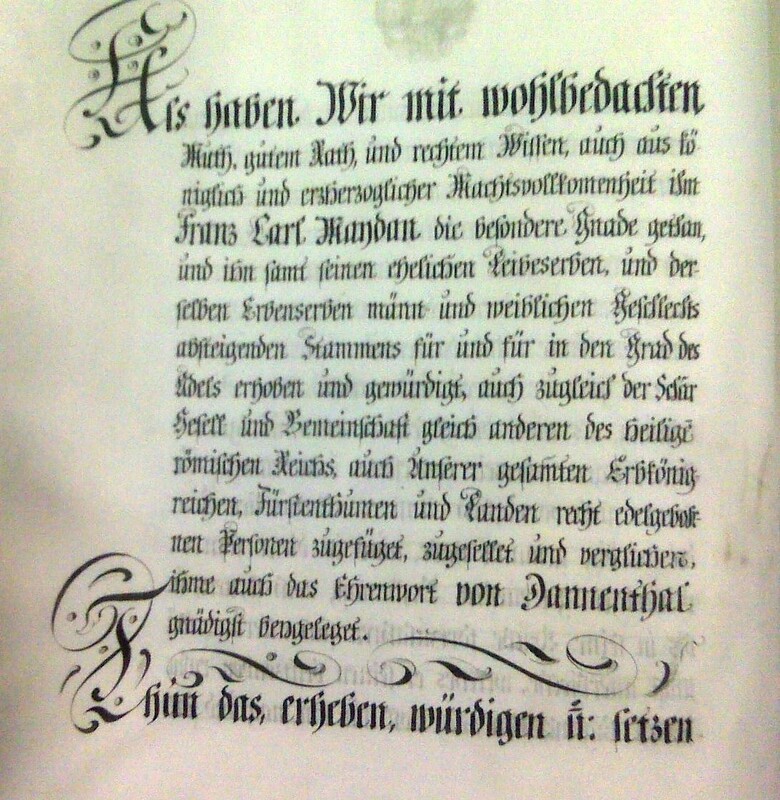 Patents of nobility were issued when a person was granted a title, and usually include a coat of arms to go with the title. 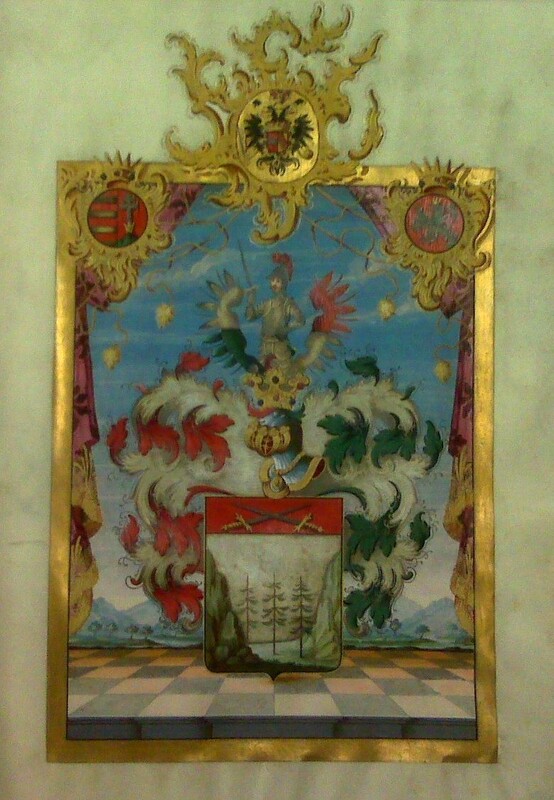 It’s a little hard to make out but it is a coat of arms. 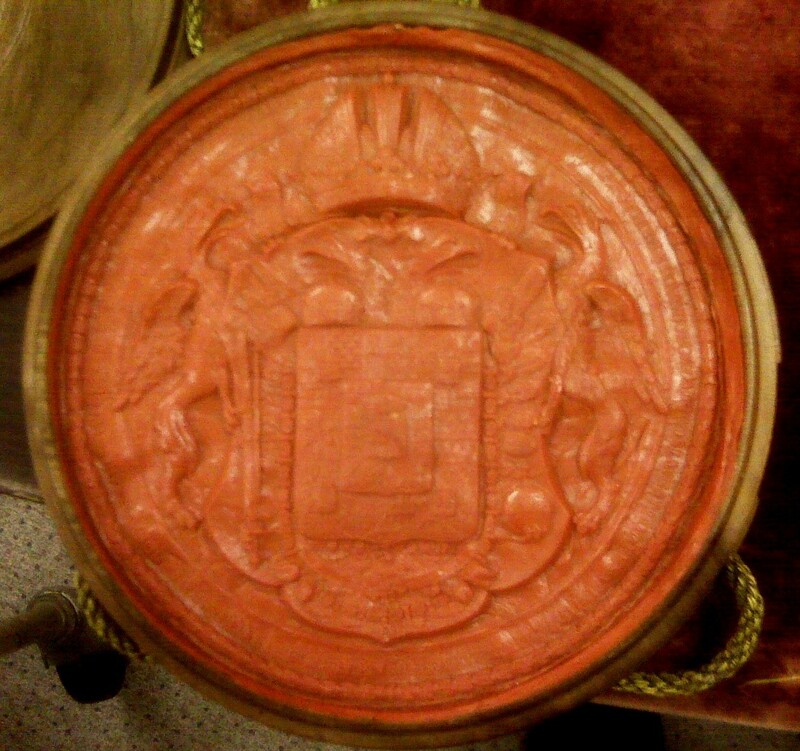 In fact it is the Great Seal of Austria, the great seal of Joseph II, Holy Roman Emperor, impressed on red wax. This sort of wax is very hard and somewhat brittle — sealing wax. Here we see his full title: Franz Carl Maydan von Dannenthal. He was apparently an artillery commander of some kind. 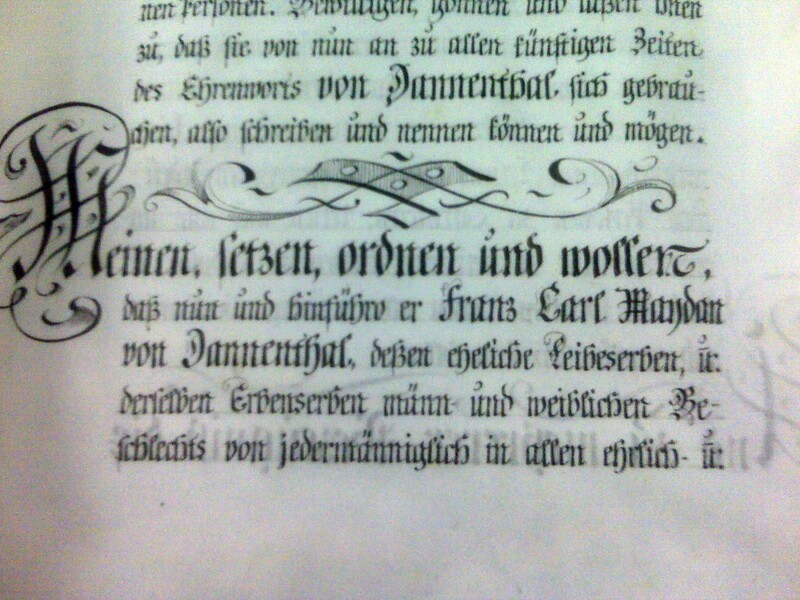 The text, I assume, explains his genealogy and what he did to earn his title, but the German was beyond me to scan and I could not take the time to try to decipher it all. He had a short entry in a reference book, which I consulted while creating an authority record for his name. Otherwise he is basically forgotten, except perhaps by his descendants. Here’s a close-up. Is that Franz Karl Maydan’s portrait at the crest, or just a generic knight? I don’t know. Unfortunately I only took pictures with my phone, so these are not great images. Still, it is quite a treasure. Very interesting, thanks. Are you familiar at all with how this was done in earlier centuries? Never gave much thought to titles in my game, but playing the video game Crusader Kings II has changed that. I know that when a coat of arms was granted in earlier times, the heralds would describe the design in formal terms (a “blazon”) and I know that the term “letters patent” referred to any formal decree by a king that was written out and read publicly. 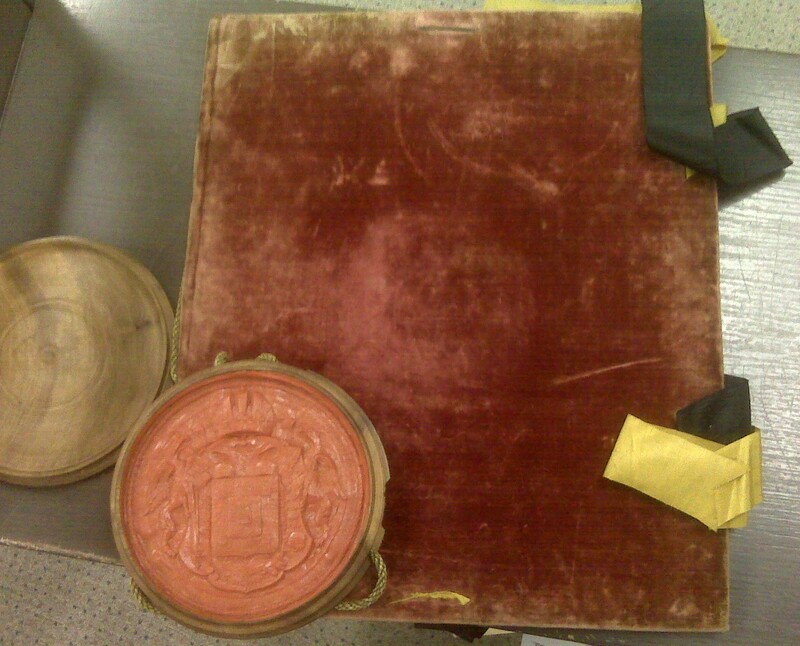 I imagine in earlier times it would just be a scroll with the blazon and king’s seal but that’s just a guess. Not really. 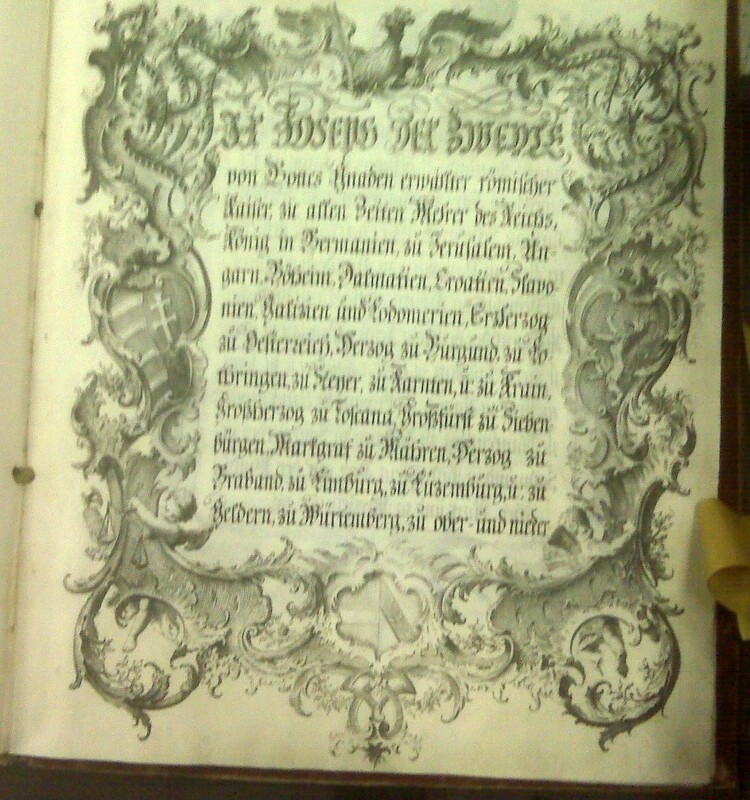 The first whole page is a listing of titles of Joseph II, starting with Holy Roman Emperor, King “in” Germany and of Jerusalem, Hungary, etc, Archduke of Austria, Duke of this and that, etc, and it looks like it goes on. The next page is courtly speech allowing only that he has done a particular “mercy” (besondere Gnade) and is raised to the rank of nobility, along with his legitimate offspring and their offspring, and that he should be called “von Dannent(h)al” in all the kingdoms, duchies, principalities, etc of Joseph’s domain. At no point does it even assign him a title, so it puts him on a footing with other hereditary knights – like a baronet, I suppose. Cool — thanks! There were several more pages of text but perhaps it’s all more of the same boilerplate stuff, and maybe a blazon of the coat of arms (“Argent field with three vert trees palewise, party per chief crimson with crossed swords” or something like that?). The seal is not the great seal of Austria, i tis the great seal of Joseph II, Holy Roman Enperor, king of Germany, Hungary, Bohemia etc. etc. 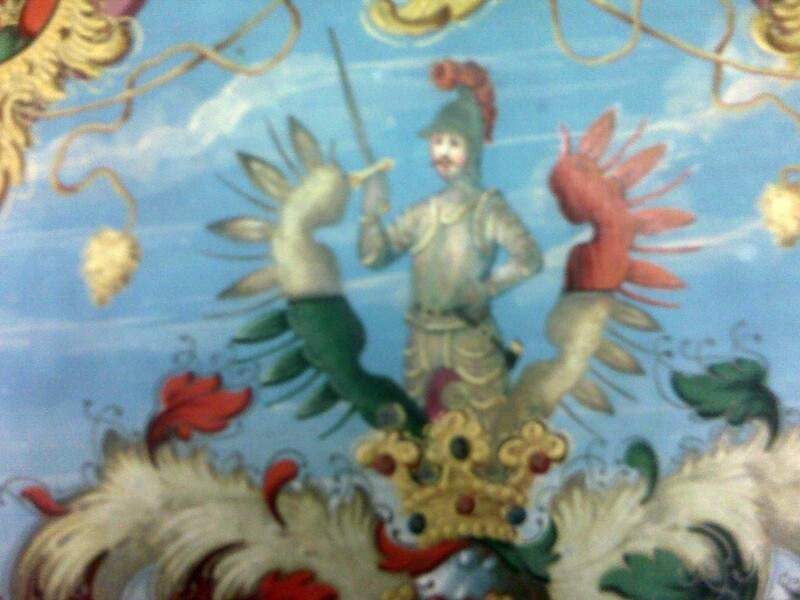 with the griffin supporters holding the coat of arms of the Holy Roman empire, a double headed eagle, which has on its breast a smaller shield with Joseph II’s hereditary arms and a smaller shield on top of that and an even smaller shield on top of that. There was no Austrian Empire until 1804.